Approaching mother’s day I’ve been reflecting back on becoming a mother myself. We all know how time flies and it seems like just yesterday I was feeding my kids their very first bites of food. I’ve always loved being there for a first taste of something new. Their first apple, strawberry, broccoli, fish, etc. I still enjoy that. But now it’s first escargot, starfruit, escarole, etc. Sometimes I think being a new mom was easier than where I am today. I’d take sloppy kisses and naps, any day over eye rolling and working school carline. Although certainly while you are in the thick of it (diapers, no sleep, constant crying), you can’t imagine. If only you had the sleep and awareness when they are babies, to appreciate every minute. Right now I know lots of mom’s with babies. Some are just starting motherhood while others have new babies to add to their families. So here’s to new and experienced moms alike. And to the new flavors and experiences we introduce them to. Whether our kids are 6 months, 6 years, 26 years or 66 years. We can always come up with firsts and new foodie adventures. But be careful…it’s not always pretty. Apples are a great first food because of their sweetness and versatility. Besides being for baby, this puree can be used in all kinds of recipes. Use it to sweeten baked goods, as a topping for pancakes, or even to dress up grilled meats. Golden and Red Delicious as well as Fuji apples have the least amount of acid, and thus are the most tolerant for babies. You may peel apples before or after cooking. Cooking with skins on allows the apples to retain more nutrients. Be sure to choose organic apples as they are number 1 on the Dirty Dozen list for pesticides. Place prepared apples in steamer basket set in a pot filled with a small amount (about 1 – 2 inches, but not to touch fruit) of lightly boiling water. Cover tightly for best nutrient retention and steam for 10 – 12 minutes or until apples are tender. Apples should pierce easily with a toothpick. Set apples and cooking liquid aside to cool. Scrape apples for skin and puree in a food processor with a steel blade. Add 1 or 2 tablespoons of reserved cooking liquid to puree to make smoother and adjust consistency. Makes 16 – 18, one ounce baby servings. TIP: An apple a day…When baby is ready for more texture, chunks on steamed apples are good finger foods. Also for teething baby, put steamed apple slices in the freezer for a soothing treat. This is an easy way to prepare fish for your baby or toddler. Because of the mild and “non-fishy” taste, Tilapia is a good introduction to seafood for a little one. Fish can be thinned with reserved cooking broth or mix with plain yogurt or cottage cheese for a more creamy texture. Heat broth in a medium skillet over medium-high heat until simmering. Add fish fillets. Broth should not cover fish, but come up about halfway. Simmer fish 3 to 4 minutes per side or until opaque. Fish should flake easily with a fork. Remove fish from pan and mash to desired consistency, or puree with some of the cooking liquid in a food processor. TIP: No bones about it. Be sure to check fish carefully for small bones before feeding to baby. Fillets have fewer bones than steaks. I see many questions and myths shared about food for babies on parenting websites and blogs. The ones that are most alarming to me are those regarding food safety and proper food handling, and all the “my grandmother used to_______” (the ______ was something like “put Brandy in a bottle” or “put honey in the cereal”. 1. Wash Hands. It’s important to wash your hands before preparing food or beverages, especially when feeding babies. According to a Penn State University study of mothers with infants less than 4 months old many moms said they routinely forget to wash their hands after changing baby’s diaper, and using the bathroom. Not washing hands could result in infant diarrhea from the bacteria transferred while engaging in these activities. 2. Handle Bottles Carefully. Although some babies will drink a bottle straight from the refrigerator, the American Academy of Pediatrics (AAP) advises most babies prefer milk warmed to room temperature. Warm the bottle by holding it under a running hot-water faucet or putting it in a bowl of hot water for a few minutes. Shake well and test milk temperature to make sure it’s not too hot before feeding. Microwaves can heat unevenly. Children’s mouths and throats can be severely burned by bottles heated in the microwave. Always discard leftover milk in bottle to reduce the growth of harmful bacteria. 3. Cow’s Milk. Avoid serving regular cow’s milk until infants are 1-year-old. Before then, infants may experience an allergic reaction, stomachache and low blood iron. When you begin serving regular cow’s milk, serve whole milk. Do not switch to lower fat milk until the baby’s doctor recommends this change usually around age 2. Iron-fortified rice cereal is usually the first food offered, as this is easily digested. 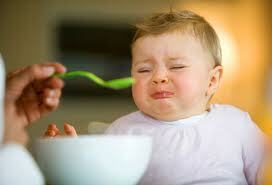 It’s frequently recommended to continue fortified baby cereal through the first year of life. Remember your baby will still be receiving the majority of nutrition from breast milk or formula during the first year. 9. Serve Solids Safely. Transfer an amount you feel baby will eat from the baby food jar to a dish. Throw away any food left uneaten in the dish. Avoid feeding directly from the baby food jar. 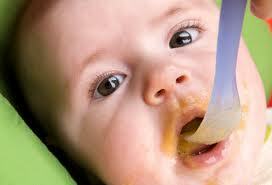 Bacteria from a baby’s mouth can grow and multiply in the food before it is served again. Use refrigerated jarred baby foods within 1 to 2 days after opening. Finally my continuing tip and philosophy is to serve organic. Try to purchase organic foods for babies and children whenever possible to reduce exposure to potentially harmful pesticides and chemicals. According to the US EPA Department of Health and Human Services, the greatest exposure to pesticides and chemicals is in a child’s first 4 years. See my post Why Organic for Kids. 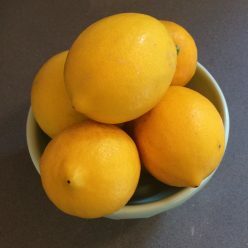 Lisa Barnes is author of The Petit Appetit Cookbook: Easy, Organic Recipes to Nurture Your Baby and Toddler and lives in Sausalito, California.